You may have heard the phrase “Don’t take any wooden nickels!” However, that advice doesn’t hold true in the district’s PBIS schools, where students are eager to earn a Wooden Nickel token from a GCPS school resource officer (SRO). Students who show good character and help others… students exhibiting acts of kindness or an understanding of their school’s expectations… Those are just a few ways that can students can earn a Wooden Nickel token. During a recent encounter, Officer Jenaro Hare approaches a pair of Meadowcreek HS students, talking together in the school’s Student Center. Officer Hare asks, “What are Meadowcreek High’s guiding expectations?” One student immediately responds, “Oh, that’s ‘Collaborate, Inspire…’ ” and the other student chimes in, “That last one is ‘Own!’ ” Officer Hare smiles, hands each student a PBIS coin, and says, “Absolutely correct, gentlemen!” The students both thank Officer Hare and admire the coins they’ve received. In the spring of 2017, the school district’s SROs piloted the Wooden Nickel token program to support and promote a positive school climate. The token program complements the goals of Positive Behavioral Interventions and Supports, better known as PBIS. The PBIS initiative provides schools with the framework to support proactive strategies for defining, teaching, and supporting appropriate student behavior to create and maintain a positive school climate. Since the 2010-11 school year, the GCPS’ Office of Student Discipline and Behavioral Interventions has supported the implementation of PBIS in 97 schools and programs. Mr. Irvin notes that SROs are involved in PBIS implementation and participate in PBIS walk-throughs at the schools they serve. The token program is one more way for SROs to engage in the PBIS conversation and connect with kids. Officer Crystal Findura, who serves schools in the Peachtree Ridge Cluster, is always looking for ways to recognize good behavior choices, reward kind acts, and acknowledge an understanding of the PBIS expectations that promote a positive school environment. Officer Findura says she often speaks to students while standing near a poster outlining the school’s behavior matrix, encouraging kids to “look for clues” to answer a question she might ask about behavioral expectations. And just what is one of the wooden coins worth? At Hull Middle, the coins are worth double the paper ‘Lion Paws’ that are given out when officers witness students exhibiting good behavior. 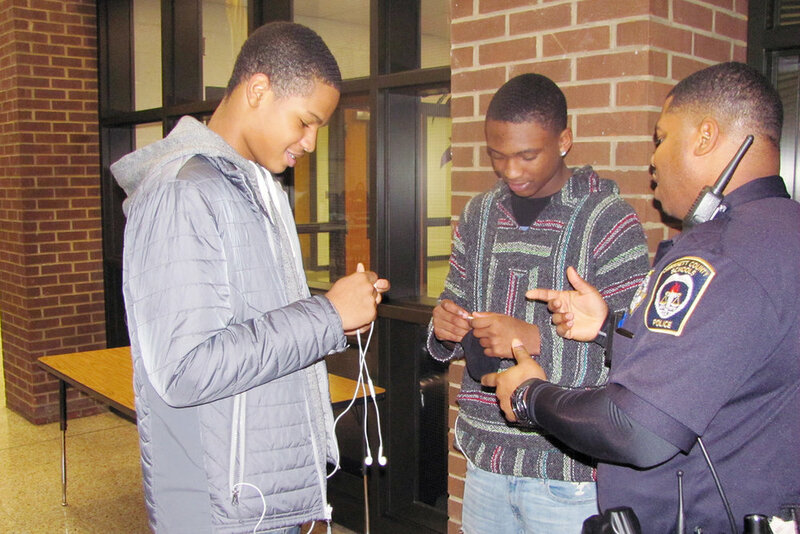 Officer Hare sees the coins as a way to encourage more police-student interaction and build a stronger bond with the students in the Meadowcreek Cluster. “We want to show them that we not only are police officers and we do enforce laws, but that’s not our only job. We’re here to talk, to mentor, and to counsel students,” he says. Last semester, a student found a cellphone in the Student Center and turned it in to Officer Hare. The action earned the student a coin on the spot. The SRO says he’s noticed that sometimes students don’t trade in the coins for rewards, but choose to hold on to them to show their friends. “That’s pretty rewarding for me and I see this as a way to encourage students to have positive behavior,” Officer Hare says. Earlier this year, the Georgia Department of Education recognized 27 Gwinnett schools with Operational status for implementation of Positive Behavioral Interventions and Support (PBIS) during the 2016-17 school year. The schools met specific criteria including required training and activities as well as a decline in discipline referrals. PBIS encourages positive behaviors with recognition for those students who exhibited appropriate school conduct.